Plaque commemorates the Bicentenary of the Battle for Vinegar Hill and the death of the nine rebels who were executed. 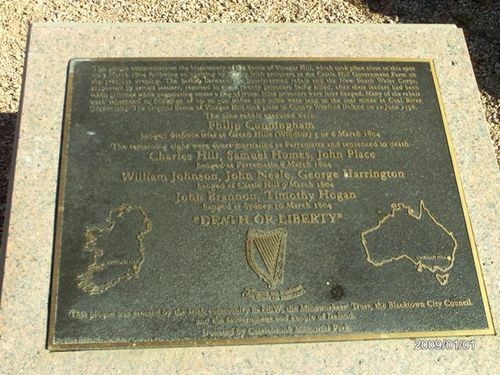 "This plaque commemorates the Bicentenary of the Battle of Vinegar Hill, which took place close to this spot on 5th March 1804 following an uprising of mostly Irish prisoners at the Castle Hill Government Farm on the previous evening.The battle, between the poorly-armed rebels and the New South Wales Corps, supported by armed settlers, resulted in some 20 prisoners being killed after their leaders had been taken prisoner while negotiating under a flag of truce. Nine prisoners were later hanged. Many of the rebels were sentenced to floggings of up to 500 lashes and some were sent to the coal mines at Coal River (Newcastle). The original battle of Vinegar Hill took place in County Wexford Ireland on 21st June 1798.
hanged without trial at Green Hills (Windsor) 5 or 6 March 1804. The remaining eight were court-martialled at Parramatta and sentenced to death. hanged at Parramatta 8 March 1804.
hanged at Castle Hill 9 March 1804.
hanged at Sydney 10 March 1804.